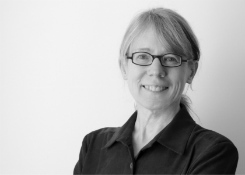 Need to design lively, focused training? Action mapping is a process I created that helps you analyze a performance problem and design solutions that work. If training is part of the solution, you’ll design challenging experiences, not boring information. 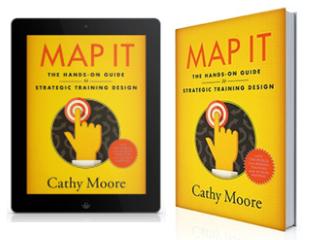 This entire site addresses action mapping and activity design, and I encourage you to explore. Below are a few highlights. Start here: Start with this quick overview of the model. I also clarify some common misunderstandings. One-page summary: Here’s a simple one-page summary of the model as presented in a keynote address. Will action mapping work for my project? Answer five quick questions to find out how well action mapping will work for your project, and get custom advice for your situation. 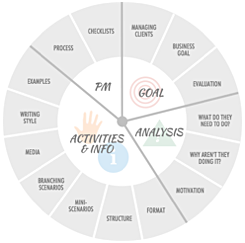 Interactive workflow: This interactive graphic describes the entire action mapping process from goal-setting to evaluation. You can download a PNG version of the graphic from the same page. Is training really the answer? Use this flowchart with your SME and, ideally, your client to answer the question, “Why aren’t people doing this thing?” or “What makes it hard?” You’ll decide how much of the problem is due to the environment, lack of knowledge, or lack of skills. The page also has a video to show you how the chart works. Checklist: Use this intentionally controversial checklist to spur discussion when you’re evaluating training material. It helps you decide whether the material is action-oriented or an information dump. 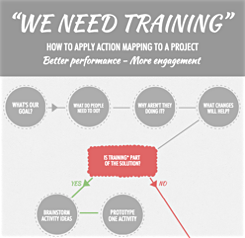 FAQs: Got a question about action mapping? Maybe it’s answered on the FAQ page.